Let the glowing metallic or vivid jewel-like tones of these innovative, decorative, non-tarnishing pastes transform picture frames, furniture, metalwork, artwork, molding, ceramics, textiles, or almost any clean, dry surface. 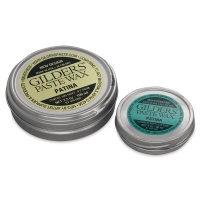 Baroque Art Gilders Paste is made of highly concentrated metallic and organic pigments blended with a wax base. It can be used both indoors and outdoors with little or no surface preparation. 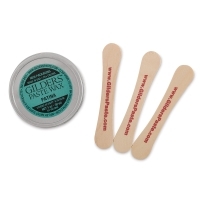 Colors are ready to apply with brushes, sponges, cloth, or other tools. There is no dripping, so masking is not required. Each 3.11 oz (92 ml) tin covers more than 100 square feet (approximately 10 square meters). Each 1 oz (30 ml) tin covers more than 30 square feet (approximately 3 square meters). Treated surfaces dry to the touch in 30 to 60 minutes. Allow 12 hours before installing or polishing. Once dry, surfaces are durable and water repellent. Clean up with paint thinner or mineral spirits. Caution — Use in a well ventilated area. Avoid breathing vapors. Avoid prolonged contact with skin. Follow safety instructions carefully. Not suitable for use by children.